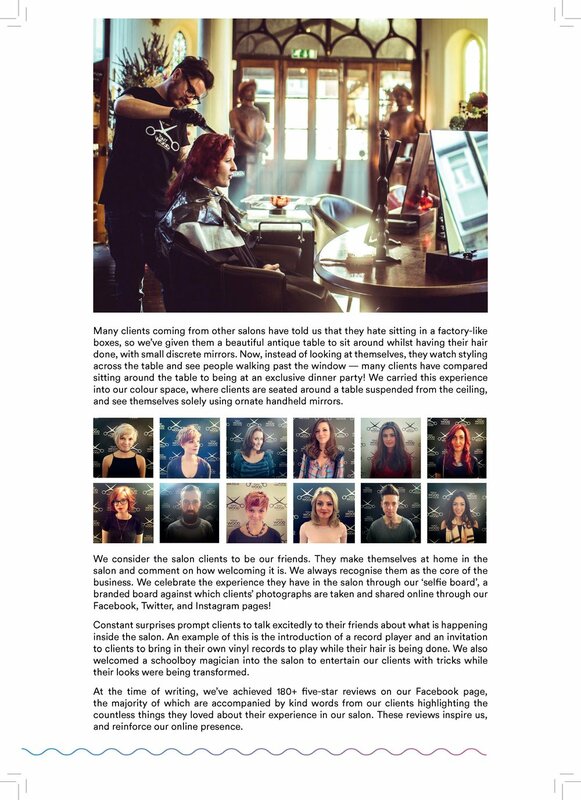 Award entries, copywriting, design, photography, filmmaking, branding, social media, and a new website for a renowned hairdressing salon on the south coast of England. Winning international awards, working with Dyson, becoming the go-to place for hair colour on the south coast of the UK — 2017 was a wild year for the salon. As things wound down for Christmas, Tony had two objectives: round up stories of the year’s successes in one place, and launch a new Tony Wood Hair website. I had a eureka moment. I built the new Tony Wood Hair website and designed graphics for an Advent Calendar system to front 24 pieces of content published to the site’s blog during the Advent period. In September 2017, Dyson asked the Tony Wood Hair team to create beautiful hair for their ‘On Trend’ catwalk show at the Westfield shopping centre in London. I joined Tony and his stylists in the capital and, over the course of six days, the team led the way on 38 shows, using the Dyson Supersonic hair dryer and products from KMS and Goldwell. I got a scar from this one! I scratched my leg open on the corner of some postmodern catwalk furniture while shooting. The video has proven useful as an introductory resource for Tony and salon manager Liam’s international work with Dyson. Every summer, Tony gives me an ‘it’s time, Jeeves’ look, which means awards season is kicking off. I write ‘em, I design ‘em, and we send ‘em off. The salon has won some pretty impressive trophies over the years. Here are the pages from one of my favorites: Hair Salon of the Year for JP South, which we won. Click/tap any of the lil images to see them larger. None of the photos are mine — they’re all shot by the incredibly creative and talented salon crew. Beneath the clocktower, in the basement, Tony, Liam, and his crew created The Colour Factory, a dedicated space for creating stunningly vibrant hair colour. While I can’t lay claim to the original Tony Wood Hair logo, I was excited to adapt it into the insignia for this new space. We printed hundreds of flyers to promote The Colour Factory before realizing we didn’t really need to, because working with Tony on upping the salon’s social media game was taking care of the marketing. Instead of trashing the flyers, we had a local upcycling designer turn them into a dress — that’s what you see above! People who subscribe to Tony Wood Hair’s Haircare Haul save 15% on their haircare every month. It’s like a subscription box of top-quality industry-standard KMS products which ensure the salon’s clients never run out of the stuff which keeps your hair beautiful after you’ve left the salon. I was going through some sort of vaguely Bauhaus phase when I branded up the subscription box. The western windows of the salon were looking quite bare until 2016, when Tony and Liam built floor-to-ceiling shelves, sourced some antique hairdressing tools, and created a miniature museum. Still, the window itself felt kinda blank. I designed some vinyl-applied typography featuring the longitude and latitude of the clocktower’s location. The miniature museum went on to spark the backwards-facing but forward-thinking ‘De-Renovation’ project — tearing into the clocktower interior’s layered history to add character instead of building new layers on top. After mastering colour in 2017, Tony and Liam wanted to refocus back on the core of hairdressing: the cut. They conceptualized the Year of the Cut, taking staff training back to raw styling and inviting well-known stylists from across the country to demonstrate their own techniques. I created the watermark above, to be featured on pictures of precision cuts tagged with #YearoftheCut.